Local Color is a relaxing book to read. The writeup is light and breezy. The pictures are lovely, watercolour swatches are pastel-like in colour scheme. It's the kind of book that you may like if you're also into books from Nigel Peake and Sara Midda. 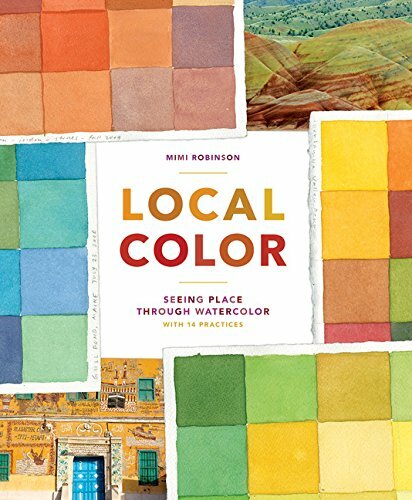 This book from artist and designer Mimi Robinson invites you to slow down to observe familiar surroundings and record the colours that you see each day for inspiration. The pages are filled with mostly colour swatches created by Robinson with accompanying photographs to show what she saw. The swatches look wonderful. There are just a handful of paintings only. There are some travel stories, actually they are more like descriptions, flowing descriptions of the colours of places and scenes Robinson has been to, seen and captured. Occasionally, there are some exercises and tips that gives you ideas on what you can do to create your own swatches, where to find inspiration or how to think about colours as a whole in your composition. Overall, the instructions are rather brief but they can be lengthy in actual practice. Downside of the book is probably the brief instructions on colouring mixing. This book shows mainly swatches and there are only six pages on colour mixing. Not only that, swatches featured throughout the book aren't labeled with the pigments used. Perhaps, it's not that guided to push you to experiment colour mixing yourself. The book would have been more useful with more instructions and colour mixing recipes, even if it's just the name of the pigments. All in all, it's an enjoyable book, recommended to those who like colours.